I'm currently on a de-cluttering and organizing binge. This, of course, might have everything to do with it. After living in our home for almost 5 years, we've got some stuff to clean out. And I'm loving the results! If I'm not actually using it, keeping it is just as wasteful as getting rid of it. If does not matter if an item could be used again later. Or if I could use it once I run out the stuff I like. If I'm not actually going to use it, it is better to give it to someone who can, or to just get rid of it all together. So, in the spirit of making it easier to know where to get started, I'm going to walk to step-by-step through organizing the cabinet under your kitchen sink. Ready? Let's go! Pull every last thing out from under the sink. Spread it out on your kitchen floor so you can see it all. Wipe down the inside of the cabinet with a good non-toxic cleaner to get any dust, grime or spills cleaned up. Be sure to check for leaks or signs of damage while you're down there. Sponges, rags, cleaning brushes, etc. Start with the last two groups: Items you have not used in more than 6 months and items you do not like. For me, this included primarily chemical cleaners I no longer used due to switching to a non-toxic alternative, items I bought but were poor performers or things I did not like the scent of. Set these things aside to either give away or properly dispose of. Look though the items in the other groups. Can you consolidate any of them? I had an almost-empty bottle of spray cleaner and a refill bottle. I refilled my bottle and could then recycle the big, empty one. Do you have multiple bottles of the same thing that you could combine into one bottle? Recycle any empties. You've done most of the work needed for this in step 3 by grouping items! I put in a divided storage basket I picked up for $1 and filled it with my sponges on one side, and rags and scrub brushes on the other. The basket helps keep them from getting lost among everything else. This middle area was an ideal place to put them since the sink pipe comes down so low that the other things I have would not fit underneath. 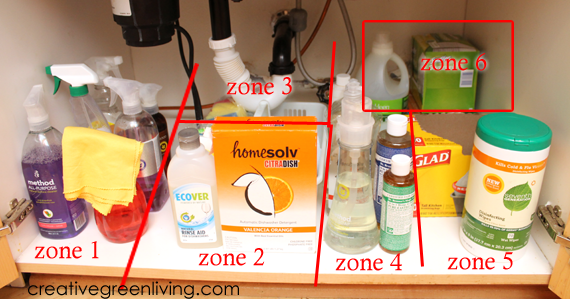 I put them in order from front-to-back of what I want to use next (once the bottle on top of my sink runs out). Before putting them away, I got rid of soaps that I didn't like the smell of to give away to other people. Includes garbage bags and a tub of Seventh Generation Disinfecting and Cleaning Wipes. These I things I might need once a week or so, and just need to grab quickly when I do. Things like detergent for my carpet steamer went back here. I don't use these things nearly as often as everything else so it's ok, if I need to reach all the way into the back to grab them when I do. Step 5: Plan what to do next! Doesn't it feel great to have that chaos under control? The fun doesn't have to stop here, make plans for what area you want to clutter bust next. I'll be sharing my adventures decluttering so be sure to subscribe to my newsletter so you don't miss out on our next edition of De-cluttering Challenge. 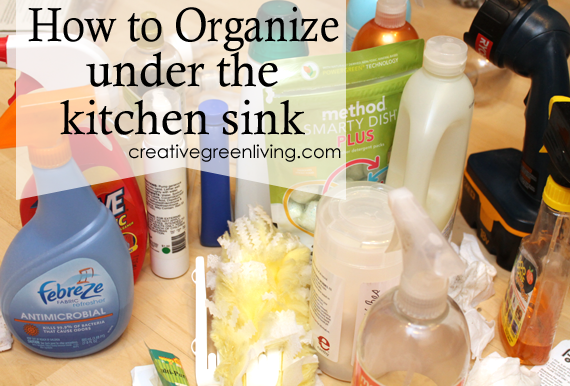 In the meantime, be sure to check out my other posts on organization as well as posts on cleaning.